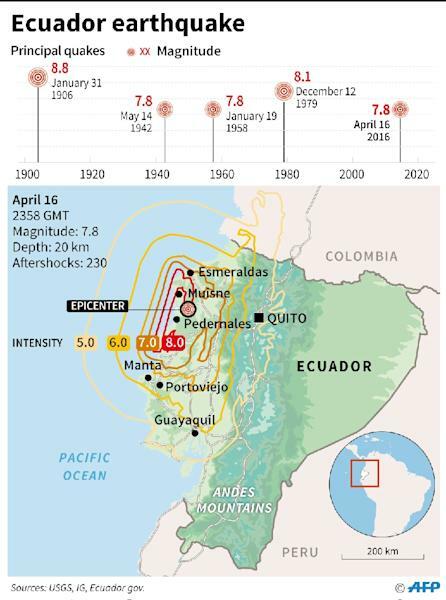 Quito (AFP) - Oil-producing Ecuador has already taken a big hit from the drop in global crude prices, so the last thing it needed was the devastating earthquake that struck last weekend. The 7.8-magnitude tremor, which killed at least 480 people, also reduced buildings along the country's Pacific coast to rubble, knocked down bridges and power pylons, and ripped up roads. 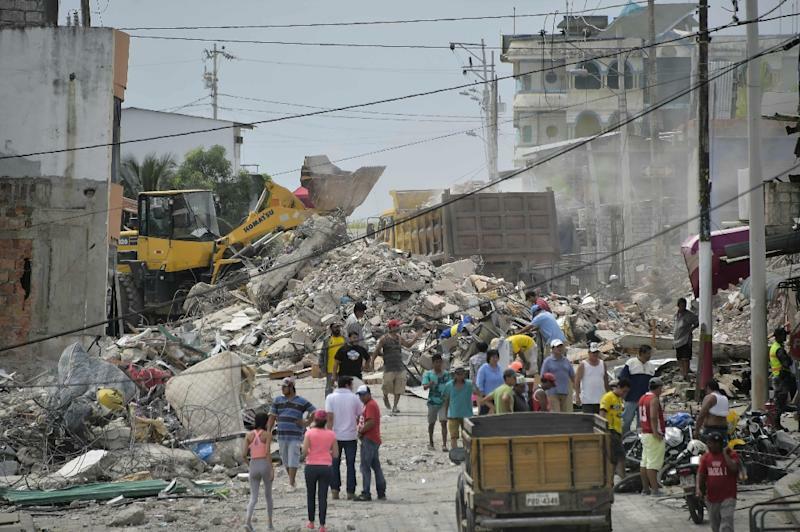 It is still too early for the government to give a firm estimate of reconstruction costs, but it looks like they will be enormous given the heavy damage, especially in tourism-dependent coastal towns like Pedernales, Manta and Portoviejo. That will be a tough blow, as the government has been trying to push tourism as another source of hard currency to offset low oil prices. "Pedernales will have to be rebuilt," President Rafael Correa said Monday during a visit to the town, as he listed especially hard-hit places that will need assistance. On Tuesday, he said the long rebuilding effort could cost up to $3 billion. Nature's timing with Saturday night's minute-long twitch of the earth was exquisitely bad for Ecuador. The drop in oil prices and a fall in non-petroleum exports has already cost OPEC's smallest member billions of dollars. Ecuador's exports have suffered in part because neighboring Colombia and Peru both devalued their currencies. That made their products cheaper for buyers in other countries, causing money to flow out of Ecuador and imports to roll back in. The government had forecast the economy would expand by four percent last year but instead it grew by only 0.1 percent. For this year, the official forecast is for one-percent growth, although the International Monetary Fund has predicted output will contract by a stunning 4.5 percent. So far the government has earmarked $450 million for rebuilding, Vice President Jorge Glas told AFP, also during a visit to Pedernales. Ecuador will also receive financing from the World Bank, the Inter-American Development Bank and other lenders, as well as aid from countries such as Venezuela, Colombia, Spain and Peru. That will cover just part of the cost of rebuilding the hundreds of buildings, bridges, roads and other structures that were destroyed in the quake. Some had been built with free flowing money from the now-ended oil boom of recent years. 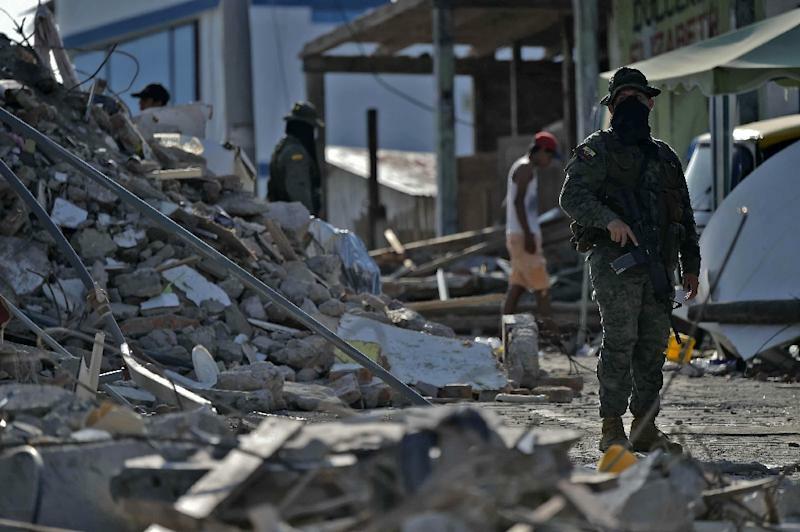 "An earthquake is always bad, but in this case it has caught Ecuador at a really bad time, with little money for the emergency," said Sebastian Oleas, a professor of economics at San Francisco de Quito University (USFQ). One good thing is that the country's oil pipelines were not ruptured by the quake, nor were refineries damaged, according to government officials. Airports in the quake-hit area are still up and running. And the areas most heavily damaged by the quake are not big contributors to GDP, said economist Alberto Acosta, of the Spurrier consulting group. "In other words, this is not going to stop production or justify an economic contraction," said Acosta. "But in these circumstances, rebuilding is going to be much more difficult, more costly, because there is no money," said Acosta, adding that the government would have to reallocate resources from other parts of the budget to help rebuild. Out in the ruined streets of the quake-hit towns, the damage has a human face. In Manta, 58-year-old Ruben Gallard saw the hotel and two grocery stores he owns come tumbling down. "We lost everything. We do not even have clothes left. We lost our only source of revenue. We need help from somewhere," Gallard told AFP as he stood beside what remains of his hotel.